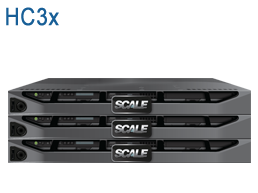 Scale Computing’s HC3 virtualization platform is a complete "datacenter in a box" with server, storage and virtualization integrated into a single appliance to deliver simplicity, availability and scalability at a fraction of the cost. HC3 OneTouch™ Provisioning - in a matter of minutes, you have all the resources provisioned to have your environment up and running. HC3 OneTouch™ Configuration - Rapidly configure your resources to match your applications using our automated, easy to use web portal. HC3 OneTouch™ Deployment - Once you've provisioned and configured, just set the thresholds your business needs, and HC3 does the rest for you. HC3 is the future of your IT infrastructure. It's a highly available, scalable platform that runs your applications. Since it's a completely integrated cluster, the HC3 brings storage, virtualization and servers and creates a solution that's easy to manage, and is turnkey. Businesses can no longer afford to sit on legacy infrastructure to run business applications, but are still forced to do more with less. Virtualization is the first step in building your infrastructure for today and tomorrow. HC3 delivers simplicity, availability and scalability all in one. No additional software license - HC3 builds in all the software intelligence of the hypervisor and automated management so you don't have to deal with overbloated licensing features. No additional hardware - HC3's integrated appliance eliminates the need for separate SAN/NAS or servers so you don't have to manage separately anymore. All of this, at a FRACTION OF THE COST of VMware and other traditional virtualization vendors! Cloud computing's many virtues are celebrated as good for business. And while a large percentage of small and midsized businesses (SMBs) have initiated or are considering the deployment of virtualization, many of these organizations are wary of moving their critical applications to the public cloud. Today, businesses, both big and small, are facing more challenges than ever. Competitive industries push the need for better technologies, more reliable infrastructures to support the business. What happens when that can no longer happen with the technology and infrastructure you have in place? When it starts to cost you more to manage and maintain your infrastructure than it’s actually worth? Why Pay More for VMware? 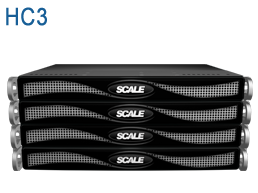 Learn more about Scale Computing's HC3. Built from the ground up for the virtualization environment, this is your answer to a VMware alternative. Learn about how HC3 is helping to end complexity with a hyper-converged, virtual infrastructure developed for small to midsized business. HC3 represents the cutting edge of infrastructure innovation: A highly available platform with the scalability of the cloud and the security of your own servers, coupled with a radical reduction in both upfront costs and TCO. Scale Computing's CEO discusses the innovative HC3 Platform. Built from the ground up for virtualization environments. See how Jasper County REMC saved $15-$20k by purchasing Scale Computing's HC3. With HC3's scalability. no SAN to purchase, and more importantly, no vTax, Jasper County REMC was able to virtualize on a budget. Our specialists are expert in designing systems that leverage Scale Computing products, and can help you create a plan for sourcing and deploying your solution. Optrics offers personalized training & installation to help you integrate your Scale Computing solution smoothly into your network infrastructure.